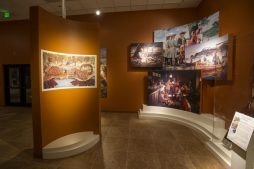 Section four’s imagery teaches visitors about the early European and Potawatomi convergence. In 1634, French explorer Jean Nicolet made initial European contact with the Potawatomi near Green Bay, Wisconsin. The fourth section of the Cultural Heritage Center introduces the coming together of two worlds. “The goal was to tell the complete story of how this pivotal period impacted the Potawatomi, their French allies and the future landscape of an American continent. Contact between these two cultures resulted from the Potawatomi fleeing the eastern Great Lakes as the Haudenosaunee (Iroquois) and their allies, armed with British weapons, pushed west with violent raids,” said Blake Norton, CHC curator. The CHC partnered with Bluestem Integrated, LLC from Tulsa, Oklahoma, to print and install the images featured in this section. The first display within this section showcases Potawatomi designs, tools and weapons as a result of early commerce with Europe including intricate silver work created by CPN tribal member Bill Madole. Madole is from the Anderson family, and as his interest in the Tribe grew, he began researching early Potawatomi jewelry. “There are different photographs from museums and pieces that are still available, and so I took the inspiration from those photographs and tried to make pieces that were historically accurate,” he said. This section features two silver conches Madole hand crafted. Madole began working with metal more than 30 years ago to keep his family’s forging tradition alive. Section four features numerous paintings by Robert Griffing. “My great-grandfather John Anderson was a blacksmith,” Madole said. “It was a very big operation, and he had an anvil that was passed down to my grandfather, who passed it down to my father, and my father then passed it down to me. While European contact brought deadly diseases and a wave of change, it also introduced new, stronger tools. Before contact, the Potawatomi cooked by using clay pots, animal hides and other natural sources. The European’s iron kettles lasted much longer than original cookware. The display also features other items the Potawatomi obtained via contact including a violin and several books. However, consequences of colonial influence quickly impacted the Potawatomi and all the Native groups in the Great Lakes region. Prior to Jean Nicolet’s journey to the Great Lakes, the Dutch made contact with Iroquois on the eastern shores of the continent in the early 1600s. New, European resources gave the Iroquois the ability to quickly and easily garnish influence over other Native groups. They conducted occupational raids and campaigns, invading the area in which the Potawatomi lived. Since the Iroquois were some of the first Native Americans to obtain firearms from the Europeans, they succeeded. The Iroquois began moving west into the central Lakes, pushing out interior tribes that did not have equal footing, he said. As a result, many of the cities in northern Wisconsin bear Potawatomi names. However, movement into Wisconsin displaced the region’s other Native groups. Because of the vast number of displaced Natives, large refugee settlements began forming. Eventually, the French and other colonists began making their way down the St. Lawrence River into the interior of the Great Lakes region. “The large trading centers of Wisconsin enticed explorers, traders and missionaries to venture into the Great Lake’s interior, creating what would become the Western Fur Trade,” he said. As the fur business grew, the Potawatomi and French had a balance of powers for a time, or Middle Ground. The French relied on their Native allies including the Potawatomi to teach them hunting techniques, form relationships with other tribes and gain influence around the Great Lakes. Trade “is what made or motivated people to interact with each other, which eventually led to intermarriage and the Métis families that we see today,” Norton said. For a time, the Potawatomi and French both experienced success. However, greed and resource depletion proved troubling. “Feeling exploited, the Potawatomi’s relationship with the French began to sour. The French were taking advantage of their allies,” Norton said. Many countries and businesses looked to make money in North America, which eventually resulted in the Beaver Wars, Fox Wars and the French and Indian War. “It really started to disrupt this very, very valuable fur trade,” he said. Continued European influx and the negative repercussions of disease and European influence on the Native American population caused the Middle Ground’s dissolution. As the Potawatomi kept pushing east, “the French followed, wanting to stick close to their valuable and protective allies. They understood that the Iroquois were defeated and peace would soon be made, opening up the lower lakes for reoccupation,” Norton said. “Some of the most violent conflicts that were ever fought on this continent were part of the Beaver Wars,” he said. 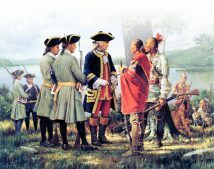 In 1701, New France and 1,300 delegates from 39 Native American nations signed the Great Peace of Montreal, ending decades of fighting. The Iroquois stopped their campaigns against other Native Americans in the Great Lakes region and allowed tribes to return to their original lands. “It’s not coincidental that after that peace treaty was signed that Fort Detroit was then established,” he said. At this time, the Potawatomi took the opportunity to stake claim over the area, and Fort Detroit served as an eastern defensive stronghold for France and its allies. While this treaty attempted to end the battle for control, the fur business proved too lucrative for peace. The Iroquois Confederacy, French, Dutch, English and American Indians continued to fight for land and rights to its bountiful resources. Strife between the British and French and their respective Native allies continued. The British joined forces with the Meskwaki (Fox), which caused the French to form a campaign against the Meskwaki. Confrontations between the two groups ensued between 1712and 1730. Records indicate by 1733, the few remaining Meskwaki sought refuge with the Sauk. 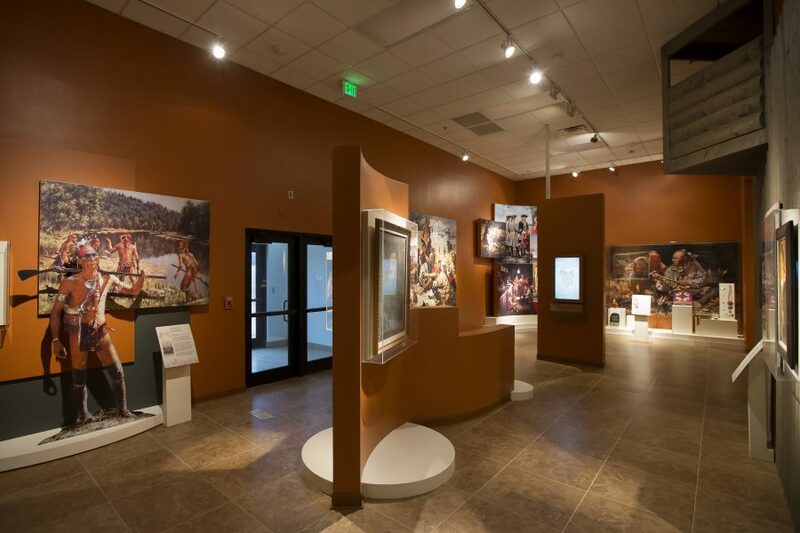 The Tulsa-based printing company Bluestem Integrated, LLC produced the replicas of paintings depicting Potawatomis featured in section four of the CPN Cultural Heritage Center. “What defines this time other than warfare was the coming together of two worlds,” he said. The paintings in this section highlight this conversion and serves as a visual reference for this point in history. The section spotlights early Potawatomi leaders including Chief Topinabee, Chief Leopold Pokagon, Madeline (Bourassa) Bertrand and Joseph Bertrand. Joseph and Madeline Bertrand’s influence in the area is evident today. Parc Aux Vaches-Madeline Bertrand Park in Berrien County, Michigan, sits near the St. Joseph River and Lake Michigan, where Madeline and Joseph once established a profitable fur-trading post. The intermarriage and the coming together of two different cultures became a defining moment for the Potawatomi and the continent. This section of the museum serves as an educational opportunity, introducing some of the first Potawatomi Métis families and features an interactive map detailing where they lived. 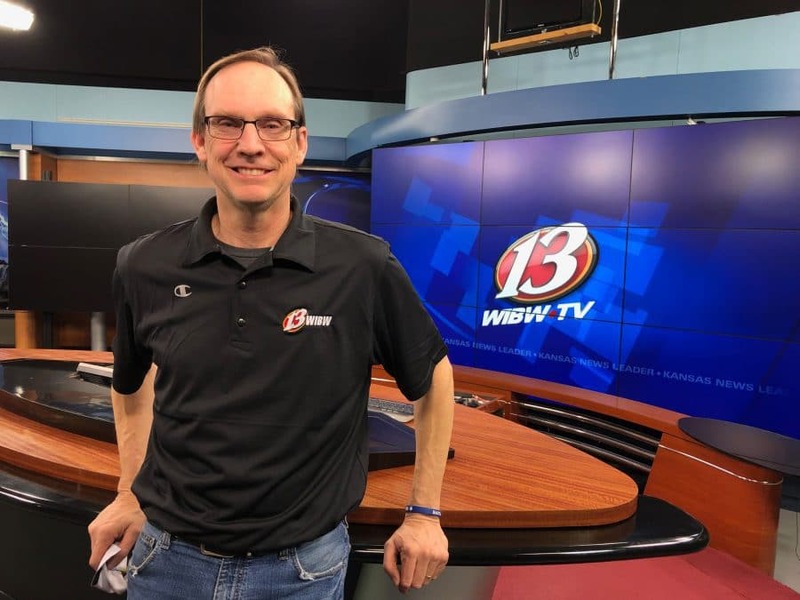 “Our Tribal members are interested in the interactive because they see their family names,” Norton said. “A lot of people really don’t know how deep that history goes back and how important a lot of these people were in history. These traders — these are the founders of major cities, Chicago being one of them. Conflict between the Europeans and Native Americans persisted. The French and their allies began converging at different spots to parlay or fight against the British, initiating the French and Indian War which lasted from 1754-1763. The fighting occurred near present-day Braddock, Pennsylvania. CHC visitors can find George Washington wearing a blue coat in the image. CHC staff chose this painting as a focal point. It highlights the Potawatomi’s strength, agility and reputation as leaders, traders and warriors during this time. These qualities played a major role following the French and Indian War as the Potawatomi would face more wars to come.